For a few years in my youth, I was in the Cub Scouts. And it has to be said, I was probably just about the worst Cub Scout ever. There were a number of different tasks that you needed to perform to earn your different merit badges and advance in the rankings, and I was hopeless at any of the ones that involved outdoorsmanship, or working with my hands, or just physical prowess in general. Nonetheless, it was the 1970s and so being a part of the Cub Scouts was somehow expected, and I did it for a while. I only mention all of this because it relates to my purchase of this comic book. There were certain stores that sold Cub Scouting supplies, a bit further out than the range of my usual comic book buying spheres. And when we went down there to get whatever-the-heck-it-was that was needed, it turned out that the little stationary store also had a comic book rack, on which this issue of GREEN LANTERN AND GREEN ARROW was found. I had missed the preceding issue, which was vexing to me, as Green Lantern was my second-favorite DC hero. But it was still great to have another book to read. This issue picks up on the events of the preceding one, but isn’t truly a two-parter. Last time, Green Lantern and Green Arrow had battled and defeated Sinestro, the renegade Green Lantern (who was nonetheless still committing mischief over in SECRET SOCIETY OF SUPER-VILLAINS, go figure.) But the emerald pair forget to search him for a second yellow Power Ring, so Sinestro quickly breaks free and goes on the lam. Pursuing him across space, our heroes have their first encounter with an object that would feature in a couple of their adventures in the years to come: the Silver Twist. The Silver Twist is a mysterious and ancient object of unknown origin, a gateway into the Twilight Zone for lack of a better term. When Sinestro fires a bolt through it while battling Green Lantern, the Twist reacts–and the trio wake up to find themselves in what appears to be medieval times. Worse, neither the Lantern’s nor Sinestro’s power rings function in this works, so when the trip come upon a woman being accosted by some soldiers, they must cope by using physical prowess all the way. The pursued woman is named Marion–and already you’re a step ahead of Green Lantern and Green Arrow, who fail to get the reference. They learn that the sinister Prince Yuan has created a dampening field all across the planet that neutralizes all forms of energy–this is why the Lantern’s power ring refuses to function. He’s taken control of the joint since the true King Rickard Stoutarm is absent. The Greens realize that if they’re ever going to find their way off this planet, they’ll need to take down Prince Yuan. And to do that, they’ll need to combine forces with Sinestro. 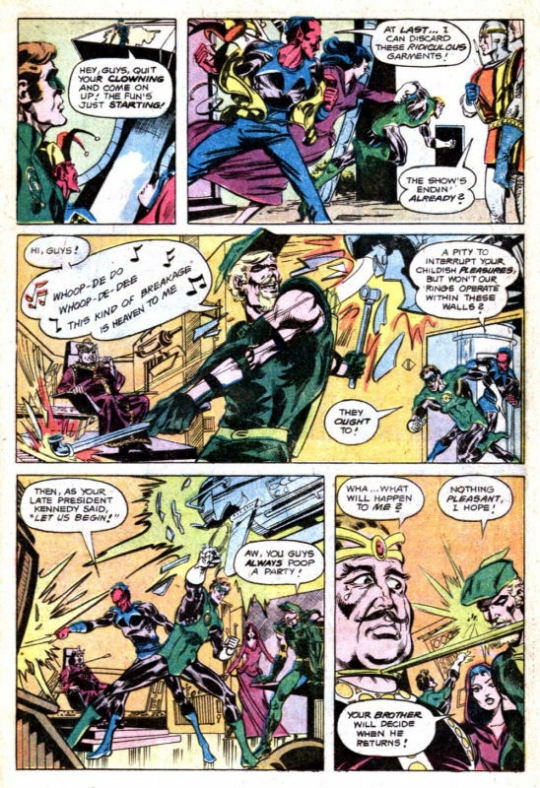 So with Sinestro dressed up as a red-faced jester (begrudging his humiliation all the while) acting as a diversion, Green Arrow makes his way into the prince’s tower and up to Yuan’s chambers. There, he learns that the Prince intends to destroy his brother Rickard’s ship as soon as it comes into range–and the peasants will never be able to revolt against him without power. 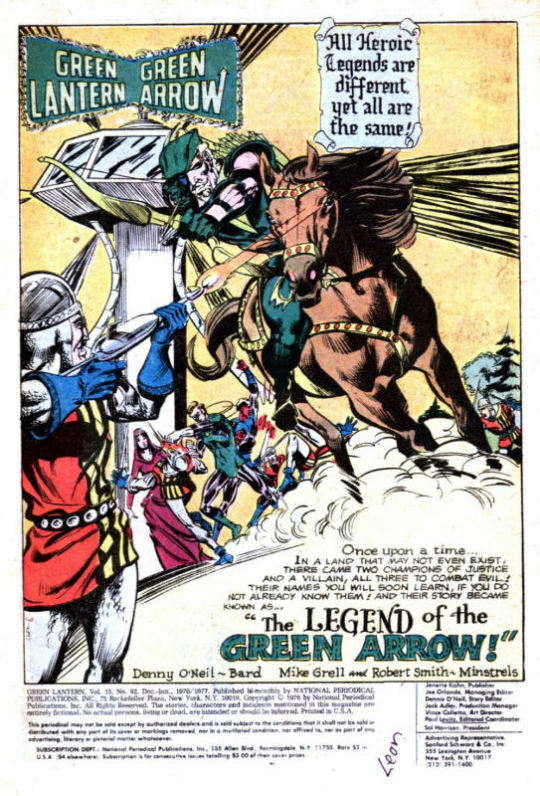 Ollie dissuades him of this notion, pinning the Prince to his chair with an arrow and destroying the gear creating the nullifying field with the help of the Lantern and Sinestro. 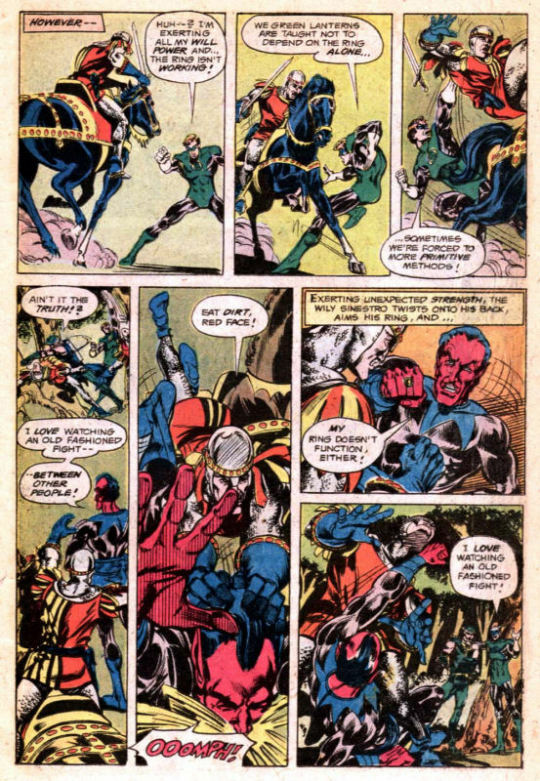 There’s still the Prince’s fleet, waiting in ambush for Rickard, to deal with, and Sinestro chooses to help Hal take care of it, blaming the Prince for his humiliation. Of course, Sinestro’s version of helping is to annihilate the Prince’s ships and men, something Green Lantern isn’t down with. 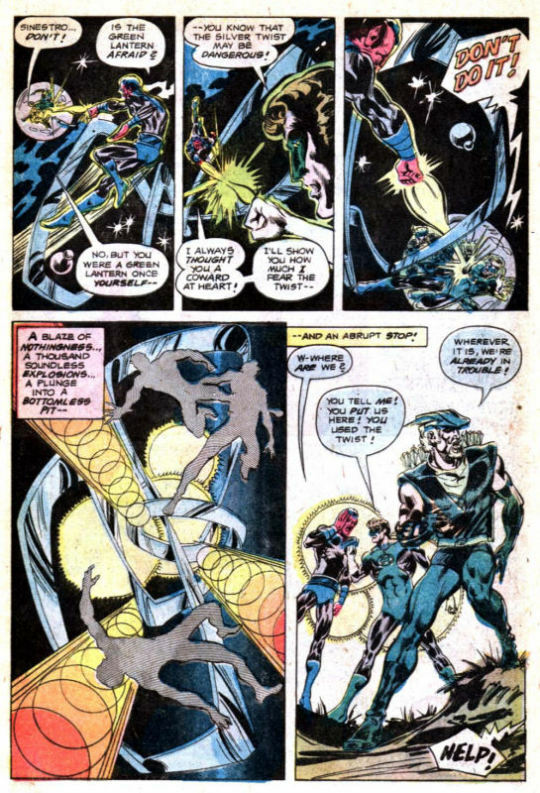 But before he can do anything about it, the Silver Twist reappears, drawing the two heroes into one side and Sinestro into the other. 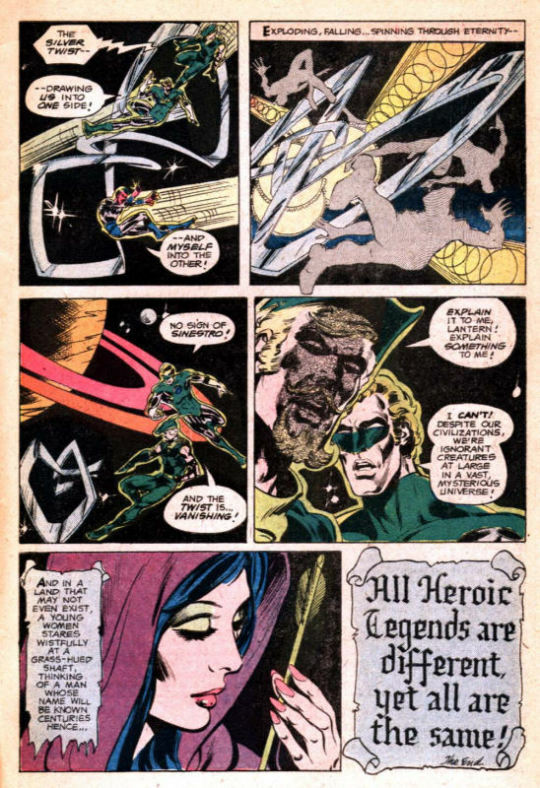 Greens Lantern and Arrow find themselves back in the Solar System, but Sinestro is not with them. Meanwhile, back in the now-freed kingdom, Maid Marion stares with longing at one of the green arrow-shafts that Ollie left behind, while writer Denny O’Neil goes out on a quasi-pretentious final caption about how all heroic legends are different but all are the same, so as to attempt to account for some of the story’s triteness.